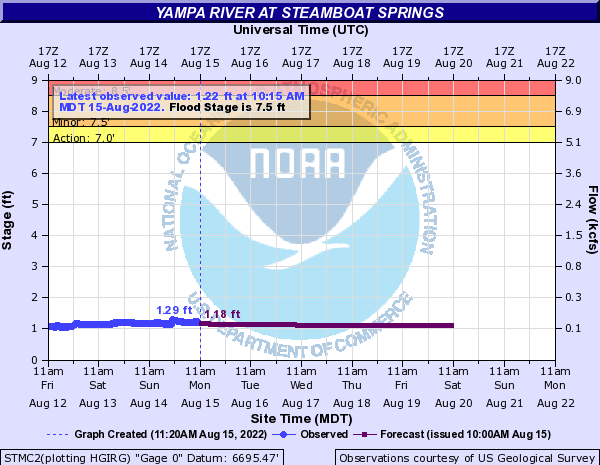 For boaters and non-boaters alike, one of the great gems of Steamboat Springs is the Yampa River, running through the center of town. On any given pleasant spring or summer day, the banks are lined with fisherman, people are dining on riverside patios, tubers float through town, and kayakers play in the manmade features. Adjacent to the library, the C-hole and D-hole are the primary features for kayakers. They each have their optimum flow range, but the C-hole is generally the best feature and offers up every trick in the book when it's in. A warm, albiet unpleasant smelling hot spring trickles in on river left. The playboating here is so good and convienent that it could trick almost any boater into buying a playboat and moving to Steamboat. The scene is almost always congenial. People tend to come and go, walking their dogs, playing frisbee, going for an outing with their kids, or just cooling off by the river and reading a book. The hole can be busy but never seems overly crowded. It's a great cool down after a creek run down Fish Creek or a mountain bike ride on any of the myriad of fantastic trail systems in the area.